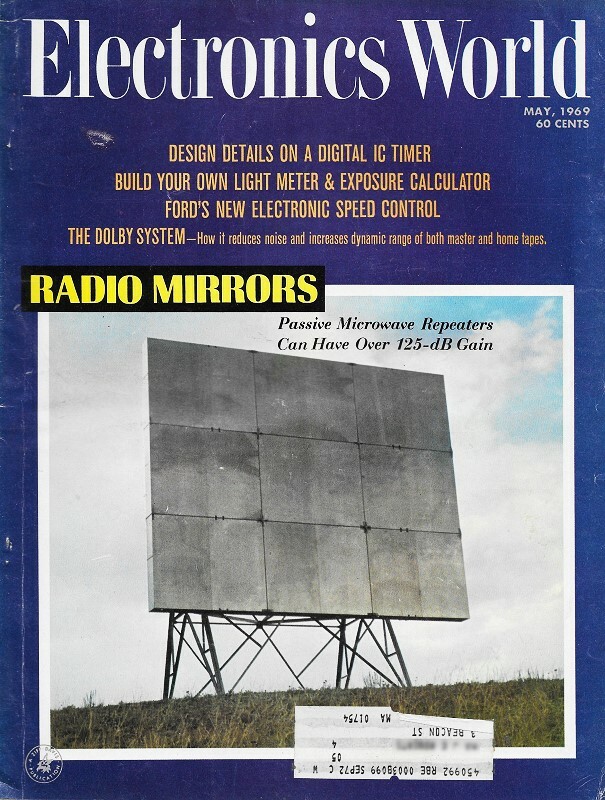 Dolby noise reduction is not really directly applicable to the RF Cafe theme, but I included this article for two reasons. First, a lot of people are familiar with the Dolby system and do not know its history or technical details. Second, the general subject of noise reduction and dynamic range, avoidance, mitigation, etc., is of interest even if the methods of dealing with audio noise is different from radio signal noise. Dolby's companding (compressing-expanding) circuitry was an adaptation of analog video noise reduction used in television. Interestingly, a lot of people evidently were skeptical about this scheme that provided "something for nothing." They figured removing something (noise) from the recorded music must mean a part of the desired signal is being removed as well. The original Dolby system might not have been as refined as today's version, but it was a big improvement over no noise reduction. 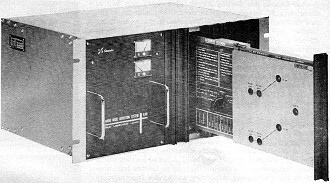 The professional Model A301 Dolby noise-reduction unit is designed for stereo tape mastering and duplicating. One of the compressor modules has been withdrawn from rack-mountable enclosure in this view. Cost of unit shown is around $1500. This system, now in use at hundreds of recording studios, improves signal-to-noise by 10-15 dB. The result is better discs made from the master tapes which are quieter and have greater dynamic range. Perhaps no other invention in recent years has caused so much talk in the phonograph-record industry as the Dolby system. One by one, record companies around the world are switching over to it, not only as a means of generating high-quality master tape copies for their international affiliates but for original recording as well. The Dolby A301 noise-reduction unit has been around now for about two years, and after an initial skepticism an the part of many record companies the unit has now been accepted. There are close to 300 units now in use at over 90 companies throughout the world. First of all, why is there a need for noise reduction? The range of sound levels normally encountered in daily life is far greater than the dynamic ranges which even the finest professional tape machines can handle. It is a characteristic of all audio equipment to produce distortion at one extreme of its operation, that is, when one tries to put too much signal on the tape. At the low-level extreme, there is the old bugaboo of tape hiss. A beautiful analogy exists between recording sound and taking pictures. Just as a photographer selects a film speed and a combination of shutter speed and lens opening to allow him to record the maximum information on a piece of film, the skillful engineer sets his recording level in very much the same way. He tries to adjust his level so that the loudest passages will not overload and also that tape hiss will not intrude upon the softer passages. Fig. 1 illustrates the photographer's, as well as the recording engineer's, dilemma. 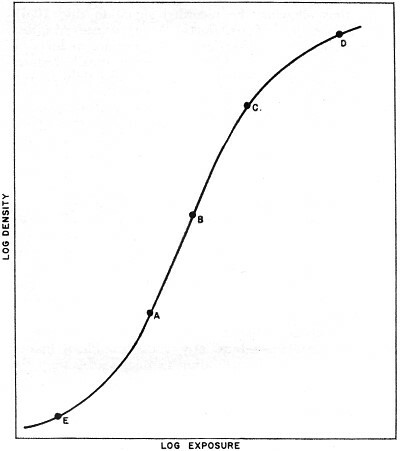 This is a gamma curve, and it is a plot of the light density of a piece of photographic film as a function of its exposure to light. The photographer wants to keep his average light values centered on the B point so that he can make good use of the straight line or most linear portion of the curve between A and C. If he over-exposes, he is up in the D area, and he will lose gradation and detail. Likewise, if he under-exposes, he will be down in the E area, and there again he will lose detail. With the human eye, the pupils contract in blight sunlight and open up in the dark. The eye, too, is limited in its "dynamic range", that is, the range of values that it can accept, and it must accommodate itself in much the same way that the photographer and the recording engineer make their adjustments. Fig. 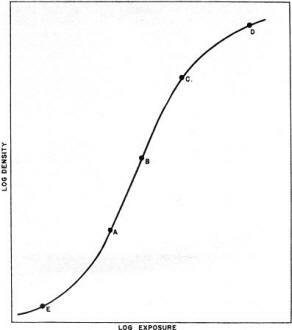 1 - Typical "gamma" curve for photographic emulsion. For a long, long time skillful recording engineers have made their level adjustments, centering the sound-signal level around some point B on a curve similar to that of Fig. 1. When the music got soft and the sound level moved down toward A with occasional excursions into the E region, the engineer would raise the input level of his recorder to bring the sound-signal level up around B again. Likewise, if the music got too loud with excursions into the D region, he would lower the input level to bring the sound signal back into the straight-line portion of the curve. After he had made the recording, he would hand-monitor the levels during playback in such a way as to provide an inverse action; that is, where he had raised the level during recording, he would now lower it on playback, and vice versa. Accordingly, a skillful recording engineer could record and play back a dynamic range that far exceeded the basic capabilities of his system. There was only one rub, however. The system would not work by itself, and the engineer had to be on hand for each playback and, furthermore, had to remember every time the necessary changes had to be made in playback level. Obviously, the system leaves much to be desired because of its complete dependence upon one individual. The next logical development was the matching together of a pair of complementary compressors and expanders. A compressor narrows or reduces the dynamic range of an audio signal, while an expander widens or increases its dynamic range. In Fig. 2 the dashed line A shows the input-output response of a standard amplifier. For an increase in input, we get a corresponding increase in output. 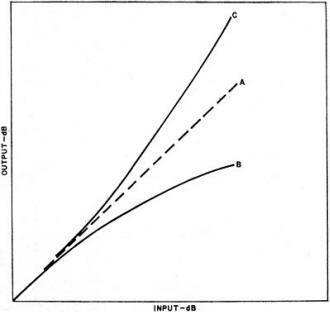 Curve B is the response of a compressor. Note that as the input increases, the output begins to level off somewhat. Curve C shows the action of an expander. Its action is the opposite of a compressor; as the input increases, the output increases by a factor greater than one. Recording engineers attempted to match the characteristics of the compressor-expander pair so that the two circuits would tend to complement each other. The compressor would obviously be used in recording in an effort to handle maximum levels and reduce distortion. The expander would then be used in playback; the idea being to restore the over-all net gain of the system to a fixed value. Such systems were more or less successful on certain kinds of music. However, there were some peculiar problems involving attack and recovery times which were characteristic of these arrangements. 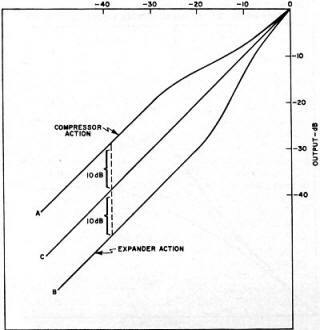 These are important parameters of any kind of compression or expansion system. Compressors have generally been made so that they attack, or go into their gain-reduction action, in a matter of a few milliseconds. The reasoning here should be obvious. When you need the gain-reduction action, you need it immediately, otherwise distortion will be the result. Once the gain has been reduced, it is desirable for it to stay at its new value and not fluctuate or return to its former value too quickly. If this recovery time were as fast as the attack time, the ear would most certainly hear it as an unpleasant modulation of the program. Customarily, recovery time-constants in compressors may be several seconds, slow enough to insure a modulation-free action of the device. In some respects the use of a complementary compressor-expander pair worked well. The built-in "following" action, resulting from the necessity of the expander to act on a previously compressed signal, caused no great problem. It did create a slight dynamic error in the over-all gain characteristics of the record-playback system, but for the most part this error was fairly small and would even tend to be masked by the program itself. Fig. 2 - Input-output curves for (A) typical fixed-gain amplifier and for (B) compressor and (C) expander circuits. The big problem with this system was the "pumping" or "breathing" action, which was the raising and lowering of background noise, a natural consequence of the system operating the way it did. This action was not apparent at all times, but it could often be heard quite clearly on solo instruments, especially when playing in either high or low registers. The foregoing method of increasing dynamic range in a recording system was never widely practiced in the recording industry. Instead, the industry looked to the manufacturers of tape machines and raw tape to come up with products which had lower inherent noise and/or higher output characteristics. This would permit recording signals with greater dynamic range. However, development in magnetic-tape technology goes along fairly slowly, and there are certain fundamental limits that simply cannot be exceeded. It is at this point that Ray Dolby entered the scene, pushing the bounds of signal-to-noise range out another 10 to 15 decibels. Dolby's method of noise reduction is essentially a compression-expansion scheme. However, it differs in several very important ways from the method outlined previously. First of all, he deals with the problem of "breathing" by dividing the recorded spectrum up into four bands, each of which is operated upon separately. For each audio channel there are four compressors working during recording and four expanders working during playback. He further minimized the "breathing" problem by using much shorter time-constants in both the compressors and expanders. Finally, he operates only on soft passages of the music, not on loud ones. as the previous scheme did. We will see presently that there is a great benefit to be derived from this. Fig. 3 shows the complementary compression-expansion curves of a typical pair in a Dolby system. Note that at input levels in the neighborhood of 0 dB there is little compression or expansion action. As the input level is reduced the compressor section tends toward an increased gain of 10 dB, thus allowing the recorded signal to ride 10-dB higher above the inherent noise level of the recorder. During playback, the low-level passages are reduced a corresponding 10 dB in level, an action which restores the music to where it belongs and at the same time depres­ses the noise level of the recorder by 10 dB. Multiply this kind of action by four, a compressor-expander pair is used in each of four audio bands, and the result is a 10-dB improvement in signal-to-noise ratio with no audible side effects. The four audio bands are: 30 to 90 Hz, 90 to 3000 Hz, 3000 to 9000 Hz, and finally 9000 to 15,000 Hz. Incidentally, the compression-expansion ratio for the 9000 to 15,000-Hz band is 15 dB instead of the 10-dB characteristic used for the other three bands. Dolby's choice of a 15-dB action above 9000 Hz complements the noise spectrum of magnetic tape better than a 10-dB action. We mentioned earlier that Dolby's decision to operate on low-level music was a fortunate one. Among other things, this means that at the normal reference levels used for calibrating tape machines and other transfer systems, the Dolby units are acting like straight unity-gain amplifiers. Thus, calibration procedures are vastly simplified; indeed they are almost foolproof. Furthermore, relegating the compression-expansion action to low-level music minimizes the "following" effect referred to earlier. Low-level music generally is characterized by fairly sustained passages with a minimum of transient action. Thus, the degree of dynamic error which results from the "following" action is minimized. At high levels there is no "following" action at all and, consequently, no dynamic error. Fig. 3 - Dolby complementary compression-expansion action. During recording (A) compression occurs; during playback (B) expansion takes place. The total net effect on the program material is unity gain at all signal levels as shown at (C). The actual circuitry involved in the Dolby process is quite complicated. We will mention only that there are a number of circuit developments in the unit which are the subject of patent applications. One of the more unique developments in the circuitry is the control of overshoot when the unit goes from very soft to maximum levels. For a pair of Dolby processors, the total overshoot will not exceed 2 dB, a value easily small enough to be masked by the transient nature of the pro­gram itself which may have caused the overshoot. Another feature of the system is the unique way of insuring precise tracking between the recording and playback functions. As many as six pairs of compressors and expanders have been rigged up in series and the maximum error between input and output has been observed not to exceed 1/2 dB. But there are still skeptics. Everybody knows that you can't get something for nothing, and many of the skeptics feel that the Dolby system must be doing something bad to recorded music. But surprisingly enough, nobody can hear it doing anything bad. Like all noise-reduction systems, it makes use of the fact that music, along with most other kinds of information, is fairly redundant, and the trade-off that Dolby makes is between noise and the accuracy of musical envelope transmission. In other words, the 10-dB improvement in signal-to-noise ratio has been bought at the expense of the "following" action referred to earlier, the fact that it takes a finite amount of time for the playback unit to "read" the processed recording and determine what has to be done to it in order to restore it to its original form, Since music is so redundant in time, the ear can apparently tolerate these small errors and even ignore them. Furthermore, the ear has errors of its own. It has its own built-in reaction times to sudden changes in volume, very much like the reaction time of the eye. Thus, there is a good bit of physiological and even psycho-acoustical masking going on here. When many people claim that they hear the Dolby system working, what they are hearing is, in effect, the absence of certain inherent defects which they may have become so accustomed to previously. It is surprising how many people who should know better, actually favor small amounts of distortion on high-level passages. Why? Probably because they are simply used to it and expect it to happen. When it doesn't happen, they feel that something isn't right. So there is still some missionary work to be done in showing people what really good, dean sound is. With the dramatic reduction of distortion and noise which the Dolby system gives us, the burden now is on record manufacturers to improve their processes so that the noises produced during metal plating and those inherent in vinyl formulations can be reduced. A master lacquer, cut from a Dolby-processed tape, is indeed almost eerie in its superquiet surfaces. If it is carefully processed, it can yield pressings which are almost as good and this should be the goal of the record industry. Ultimately, it. could be possible to employ a Dolby playback system in the home on which either processed records or processed pre-recorded tapes would be played. The record companies would simply have to cut their master lacquers directly from a Dolby plaster tape or make their pre-recorded tapes from the same thing. These products would then be played back in the home over systems containing the equivalent circuitry of the playback portion of the Dolby A301 unit. Such a device might look like a small preamplifier with perhaps two knobs on it and a meter for calibration, inserted between the conventional preamp and power amplifiers of a standard system. It is hard to tell how much a device like this would cost but it could be quite inexpensive. At least one manufacturer of consumer high-fidelity products, KLH, is marketing a tape recorder with a modified Dolby record-playback function. The scheme is not as sophisticated as the professional units but it does work surprisingly well. It yields a drastic reduction in tape hiss and enables the user to make really good 3 3/4 in/s tape copies. This is but the first consumer application. Doubtless we can look forward to a more sophisticated approach, hopefully a four-band scheme like the present professional units, for the ultimate in reproduced sound in the home.